Income from associated entities is not counted, as you well know young Clusks. Annex F sections 1-6 (page 89). Strangely enough, City turned a profit last year. And Bernardo Silva was largely paid for by UEFA returning the £33m that they had previously fined the club, therefore recognising the fact. I read a piece the other day that speculated that PSG may well have to sell off a good number of players to get their finances in line to avoid FFP violations. They've got a lot of players they can sell. It probably makes sense for them, in reality terms it's a stupid amount of money, but they'll probably make it all back in shirt sales and advertising, really. In any case, the fee will go on their accounts over the length of his contract. Presuming it'll definitely be a 5 year deal, that's 44.4m Euros each season. Say they sell Veratti and Aurier, that could be about 100m Euros, almost halving the fee. I wouldn't recommend selling Veratti though! Also, can bet your bottom dollar that the Parc des Princes will be getting a sponsorship name. But that 45 million is before Neymar's salary, which will be another 40 million. That's 85 million per year for five years. My understanding is that they're trying to creatively position the buy-out fee as not an expense, but it'll be interesting to see how UEFA views that. I have no idea what'll happen, but it would be interesting if they had to dump quite a bit of the surrounding quality to keep Neymar, which compromises any Champions' League run they may make. Or Neymar moves then PSG gets what would be their second violation of FFP rules that in turn results in a ban from Champions League play. That'd be super funny. I have to admit, La Liga accusing teams of 'financial doping' is a bit rich. Let's not be talking about the 'mas qui un club' ditching shirt designs supporting Unicef for ones sucking at the teat of Qatar (hence them not making too much of PSG's Qatari backers). Or the 500m illegal state aid provided by the Madrid municipality to bail out Real Madrid by buying their training ground 'to build apartment blocks'. On the direct flightpath into Madrid airport. Where buildings were limited to 5 floors. Or the fact that RM continued merrily on with an overdraft of over 100m for years, based on the fact that any bank foreclosing on them would be joining them pretty soon after. La Liga as the guardians of FFP. This from the country who's federation head resigned last month after being arrested on corruption allegations. Surely they've breached Neymar's contract by rejecting the offer? One question I have about release clauses is, do they suggest that the whole amount deifnielty has to be paid up front? Or could I, theoretically, bit 222m for Neymar in 222 million instalments? Would they have to accept that? Find it quite funny they're complaining to UEFA really, for all UEFA know, they can easily balance their books by selling a few players, which is when they're concerned with overall finances. Just throwing their toys out of the pram because someone else now has the money and pulling power Barca and Real do. Michael Eisner of Disney fame (and sons) have bought 100% of Portsmouth for £5.67M so that's also interesting. "Neymar moves on a free after he terminates his contract for Barca breaching it" is something I could get behind. Ditto "Barca banned from European football." It's funny how they've turned heal in the past few years, though I know dave's been banging the "Més que un club" is nonsense branding drum in forever. The way the club played under Guardiola, with Messi/Iniesta/Xavi at the peak of their powers was at times one of the most beautiful things I've seen. I only started watching European football about a year and a half ago, and it's bizarre seeing these clubs actually try to draw a line in the sand regarding how much money is too much. Living in the US, most sports leagues have some form if salary cap, and frequently revenue sharing. Those things lead to more parity, but they probably wouldn't make sense in a Pro/Rel world. I hope this turns FFP on its head. No clue what the actual rules for a buyout are. If this was Football Manager you could trigger a release on a stretched out deal but it's not like you could stretch it to 20 years. Neymar is clearly good but not 220m good. I think Barca is just posturing because why not? They will take the money but why not haggle on terms + get PSG in other trouble also. Real are the winners. Probably sitting back having a good chuckle because the original big PSG target was Ronaldo at the start of the summer. If Real signs Mbappe over Barca they're double-winners. Just to clarify, it's La Liga officials, not Barca, that refused the transfer payment. I also read somewhere that over the last 3 years, Neymar senior (appearances 0, goals 0, assists 0) has been paid more by Barcelona than one Lionel Messi. He got something like a 40m contract negotiation fee. In all honesty, Barcelona shouldn't be that arsed. He's the weakest of the 3 upfront, and 200m buys you a lot of quality in replacement. He's got 40 appearances in a second tier league. If you pay more than 40m for him, you've taken an enormous punt. There's always been something a bit self-righteous about Barca branding themselves as the white hats all the time, even when Pep was there. It may be more of a British thing, but there's always something a little distasteful about people patting themselves on the back for their philanthropy, or even worse trumpeting it all over the place. Last time I was at the Camp Nou was 2006, and the amount of 'Mes que un club' stuff around was like someone walking round with a big neon banner over their head which read 'I Give to Charity'. Ditto with their transfer dealings - tapping up players at other European clubs is standard for them, yet they bleat about Neymar in the press. When Milan got took over, I saw doubts over the owner validity due to a hedge fund, but every competitive Serie A team can add about 20m to the tv rights deal, in my opinion. The league is still a big draw, and Milan are still a big name, if not the biggest name outside of Italy (as much as Juve would like to think, more people outside of Italy have a soft spot for Milan.) Serie A needs to shake its reputation as a defensive league, it's far from it. Now Monaco have been torn apart, Napoli are by far the best attacking team to watch in Europe! I'd like to see how Milan approach this season, they could easily win either serie A or the Europa League, but they must focus on one. A translation on the replies suggests something about Szczesny's transfer to Juve, and Digby is a known Juve fan and somewhat biased. It's also being reported that it's Neymar, not PSG, who have paid the buyout clause. Technically, I think that's how they work. The player buys his way out of his contract by paying the buyout fee. But in this case PSG is providing the money for Neymar to buy out his contract. Kind of semantics, but it connects to FFP rules in some interesting ways. At one point there were reports that Qatar was going to pay Neymar $250 million to promote the next World Cup, thereby going around PSG altogether to avoid PSG having to deal with "spending" $250 million of their club's finances. I'd bet PSG has some creative financing of this in place to try to avoid having to deal with the buyout payment landing on their books. What UEFA will think of it all should prove interesting. As an aside, Forbes reported that PSG had operating revenues of $92 million last year, and Neymar's costs prorated over five seasons will cost them roughly $80 million/year. It's hard to see how they can stay in line with FFP rules given that starting point, and a current average player salary of about $5 million per year. I viewed that as La Liga making the stand so Barca can save face, but I'm probably wrong. Wow, I had no idea they were all hovering around 30. That's a really good point. Especially with all the games they play in addition to the regular season, that's got to be tough as they get north of 30. Barcelona 2016 revenue was a record $750 million. And they just started this year season with a $250 million bonus. I agree they need to make smart signings, but if they spend wisely they can buy their way to a strong young team in a fraction of the time it would take another club. 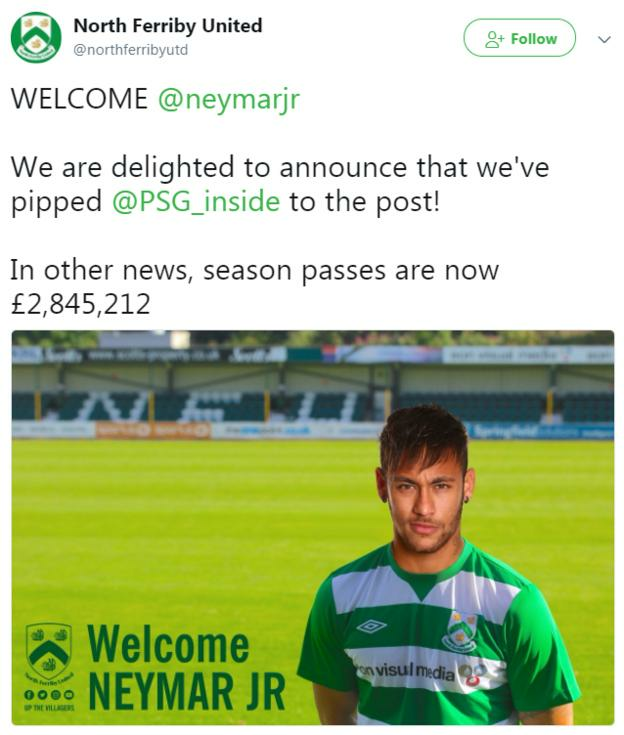 English non-league side now claims to have jumped in on the Neymar transfer. I'm not 100% certain but I think the reason the Spanish league has forced buyouts is related to a player being able to break his contract. Some pseudo lip service to the fact players are not actually 'owned' like cattle because they have this out option. Even if it's ridiculously not true. And therefore the buyout is actually some silly number derived from his salary. So PSG giving Neymar the money might be partially a gimmick to avoid ffp but also how a player activates that buyout clause. He actually pays the club to cancel the contract to free himself to do as he wants. I might be 1000% wrong tho. Edit: zilla said the same thing I was saying but I'm a skimmer who's been drinking. With the "derived from his salary" bit I believe you're kind of confusing Article 17 (which allows players in football, not just Spain, to buy out their contracts) with the buyout clause in general. My understanding (which is just remembering or mis-remembering stuff Sid Lowe said) is that for whatever reason the letter of the law in Spain is players are supposed to be the ones triggering their buyout clause by making the payment but the convention has been that any club willing to meet the payment can trigger it. yea I'm probably getting it backwards on how the price is set. Good read and specifically football is just fine. What I really don't get is people acting like the sky is falling. 1. It's sports 2. An oil rich nation that is a money sink just blew some of its money back into the economy the way they wanted to spend it. The greater implications of how and where that money will flow is much more complex to track but I'm sure the French and Spanish governments will be happy to keep a keen eye on what parts of it they get to tax. If you haven't seen it already, Besiktas by a long distance, have the best transfer announcement video. That Besiktas video's great but they could sign Ronaldo and there's a good chance I wouldn't know who it is because i'm so bad at recognizing faces. What a fantastic match the Euro 2017 final. For the first 70 minutes it felt like the ball was never out of play. I really wanted Denmark and Nadim to win it but the Netherlands were deserved winners. Shame it wasn't on TV in Canada where the rightsholder thought it that Sportscentre repeats, a car advertorial show, and Mayweather/McGregor 30 minutes of hate was a more interesting spectacle for 4 of their 5 channels. They showed the highlights and talked about the game last night on The Express Xtra. It looked like a great game. My first reaction was "Wow, both teams look better than the USWNT did in their recent tournament." Hard to say only seeing a couple of select minutes, of course. It was a really good game, highly entertaining until the last 10 minutes or so when Holland just played keep-away in the corners, and Denmark just didn't have anything left in the tank to get the ball back. And the few times they did, they were stupid with it (ie, tried to play long ball which very very rarely works). The lunch conversation today was fun, basically everyone agreed that the DWNT could beat the DMNT atm, I'm not real sure of that but they are much more interesting to watch and are actually good. The DMNT is still living in the past of 1992 (not as bad as England but).